If you’re not using Visual Studio 2010 (or don’t want to use the provided zip file), adopt the following settings. Specify NativeLib as dependency for PInvokeTest. Right click on PInvokeTest and choose Project Dependencies.... Then select NativeLib and hit OK.
Change the Output path (under project settings: Build) to ../Debug and ../Release for the different Configurations respectively. First, let’s create a native function called print_line(). The modifier is static extern. extern means that the function is imported from C/C++. static is necessary because the function has no knowledge about the class Program. The name of the function matches the name of C/C++ function. The type of parameter str is a .NET type (here: string). P/Invoke automatically converts (also called: marshals) data types from .NET to C/C++ and the other way around. The attribute [DllImport] specifies the name of DLL file from which we import the function. Note: DllImport allows you to control almost every aspect of the import, like providing a different .NET method name or specifying the calling convention. Now compile the project and it should print Hello, PInvoke! to the console. There are a couple of things that can go wrong with P/Invoke. As the error message suggests the DLL “NativeLib.dll” could not be found. The problem here is that Visual Studio doesn’t copy native DLLs to the output directory of .NET projects. Solution: Change the output directory of the .NET project (PInvokeTest) to match the output directory of the native project (NativeLib). In PInvokeTest‘s project settings under Build choose ../Debug and ../Release for Output path in the respective configuration. 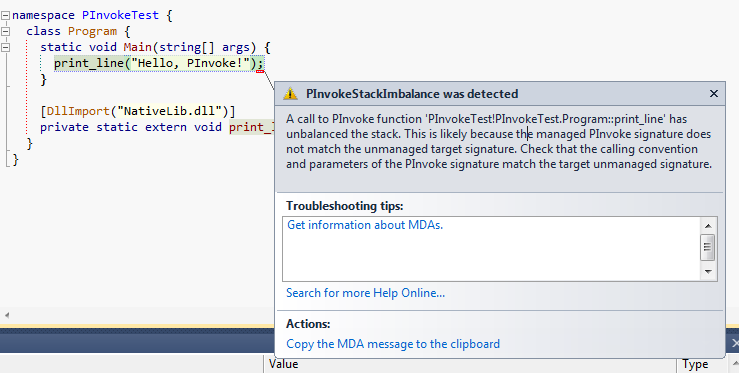 You may get an error saying that a PInvokeStackImbalance was detected. The reason is most likely that the native library uses another calling convention then the .NET project. By default, C/C++ projects use the __cdecl calling convention, whereas [DllImport] uses __stdcall by default. Change the default calling convention for the native project. This is done in the project settings under C/C++ –> Advanced –> Calling Convention. Add the desired calling convention to the desired C/C++ functions, for example: void __stdcall print_line(const char* str). This will only change the calling convention for these functions. In most cases, it doesn’t matter what calling convention you use. There are some differences, though. You can read more about these differences in the Code Project article Calling Conventions Demystified (Section: Conclusion). Don’t specify a file extension (.dll) in [DllImport], like [DllImport("NativeLib")]. This way the appropriate file name will be chosen automatically. Note, however, that this only works as long as there is no dot in the file name (like in System.Network.dll). Or: Always specify the full Windows file name (i.e. including file extension) and use Mono’s library mapping mechanism to map platform-dependent file names to Windows file names. You need to learn a new language (if you only know C#; even if you know C++ as well). See my C++/CLI Cheat Sheet for an overview. C++/CLI is not supported by Mono; so you can use C++/CLI assemblies only on Windows. This explains why I get cant find dll error for pinvoking used at large codebases. For that, you can add a link to the unmanaged DLL as a file in the C# project, and set Build Action to None and Copy to Output Directory to Copy If Newer. Hi, I still have the DllNotFoundException problem. Could you explain me exactly what I need to do to solve that problem? This is good. Please share us if you examples for Reverse PInvoke. Hope you guyes can help me. I simply cant get this stuff working. I have some vb code, which is used somewhere else in our organisation. Now I need to use that particular dll from c#. *** My C# code snippet. Section “Stack Imbalance ” helped me especially. Had no Info what correct calling convention to use . Changed to Cdecl and it worked.